Sounds great, but what are the hidden costs of hiring a bankruptcy attorney for “no money down” or only $100? Sure it’s only $100 to retain, but the total fee is probably close to $1,900. Yes, you can pay in scheduled monthly installments for over a year until the fee is paid, or you could hire another bankruptcy attorney for a fraction of the price. Yes, some cheaper bankruptcy lawyers charge the whole fee upfront, but the total price could be half of what you’ll pay the “$100 down” bankruptcy attorney in the end. $100 down will probably get you two things: (1) a signed representation agreement which probably obligates you to make scheduled monthly installments until a very high fee is paid & (2) the firm will accept calls from creditors on your behalf. No, the firm probably will not send letters to your creditors. No, the attorney will probably not be available to answer your questions over the year-plus it’ll take you to pay the attorney fees. For every attorney time is money. If you only pay $100 the attorney really won’t give you hours of their time. Rather, they’ll collect your payments month-after-month until the total fee is paid. After that they will do what any cheaper bankruptcy attorney would do: they’ll prepare your bankruptcy forms, file the case and represent you at the meeting of creditors until your debts are discharged. To qualify for chapter 7 bankruptcy your average income for the 6 months prior to filing bankruptcy must fall below a certain figure or you must pass the “means test” which is a calculation largely dependent upon your income for the 6 months prior to filing bankruptcy. Accordingly, the date you file bankruptcy is incredibly important. 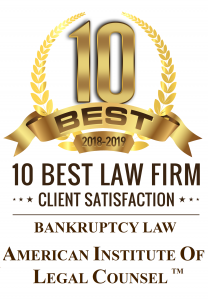 While you may qualify for chapter 7 bankruptcy at the time you hire the “$100 down” attorney, there’s no guarantee that’ll be true after you finish paying the attorney fees. $100 Down vs. Half The Fee? Individuals considering bankruptcy must decide whether to hire the “$100 down” attorney who will really cost close to $2,000, or a cheaper attorney who will require payment-in-full. It’s not an easy decision to make, but consider this: every bankruptcy attorney requires payment-in-full before filing a chapter 7 bankruptcy.